Who Picked Ruth Bader Ginsburg? Ruth Bader Ginsburg was Mark's #2 pick in dp10 for 0 points. Ruth Bader Ginsburg was Terry D.'s #5 pick in dp11 for 0 points. Ruth Bader Ginsburg was Bill's #3 pick in dp12 for 0 points. 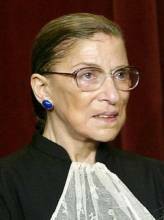 Ruth Bader Ginsburg was Bill's #6 pick in dp13 for 0 points. Ruth Bader Ginsburg was Heff's #6 pick in dp17 for 0 points.